Problems resulting from the increasing complexity of today’s real-world challenges cannot be solved with standard solutions, and the need for innovation competence is more important than ever. In this societal transition, the role of higher education institutions changes, and meta-innovations in which tacit knowledge is transmitted in the context of working life, are key. 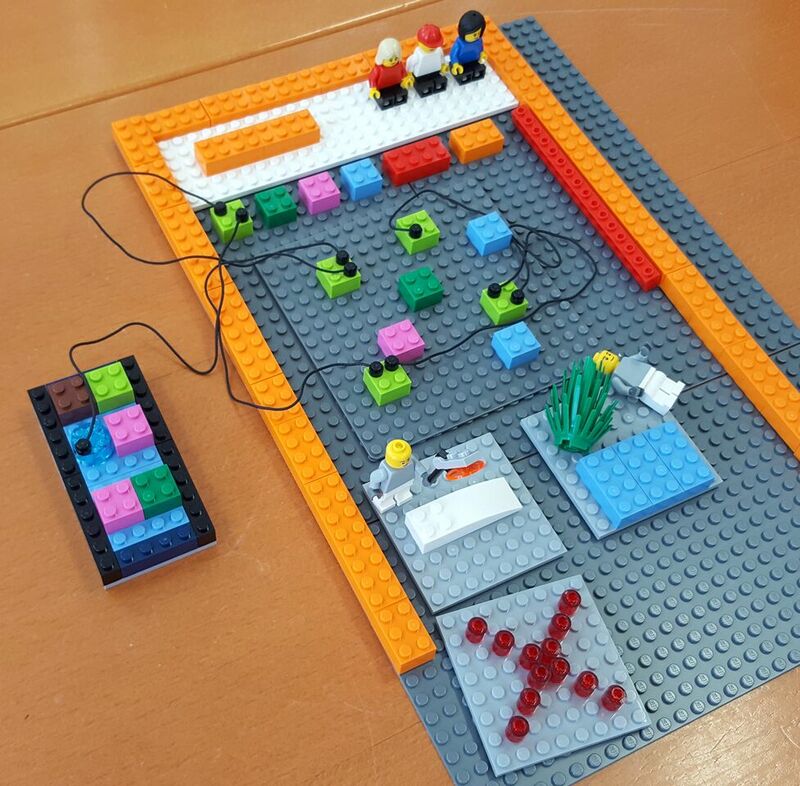 The purpose of this paper is to suggest a design of an innovation course in higher education in the context of digital entrepreneurship education based almost exclusively on LEGO® SERIOUS PLAY® (LSP). In two classroom-based training sessions, 38 students experienced through an extra-occupational master programme the entire cycle of innovation from ideation through prototyping to future scenarios. 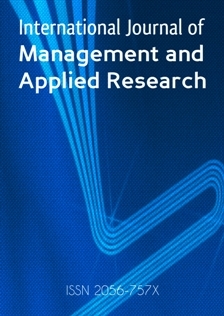 Furthermore, LSP was used as an evaluation method to assess the LSP method itself in the context of higher education. Based on the evaluation, the main advantages of LSP included the exchange of ideas, creative thinking, representation of information, the quality of group interaction, and enjoyment. The main disadvantages were the reluctance of participants, obstacles to implementation, criticism of the outcome, and limitations of the method. The design of the innovation courses allows researchers and practitioners to apply LSP in other higher education institutions as well as in in-house seminars in the industry. The changing role of higher education institutions towards knowledge production, innovation, and solving complex real-world problems has led to new initiatives and reform processes (Altbach and McGill, 2007; European Commission, 2015; Fry et al., 2015). The main question for this investigation was how to design an innovation course in which students experience the entire cycle of the innovation process in the context of digital entrepreneurship education. This cycle ranges from the initial phases of a system to problem understanding, ideation, and feelings of great enthusiasm. However, it also includes the burdensome elaboration of ideas and the potential pitfalls involved in innovative endeavours. Finally, a solution and reflection on the collaborative process is included. A typical course design on innovation presents innovative products, processes, and companies followed by a discussion of the life and work of highly creative people from Leonardo da Vinci to Steve Jobs. This method may be inspiring and insightful, but it alone does not provide experienced-based learning and meta-innovations where tacit knowledge is transmitted in the context of working life (Kettunen, Kairisto‐Mertanen, and Penttilä, 2013). 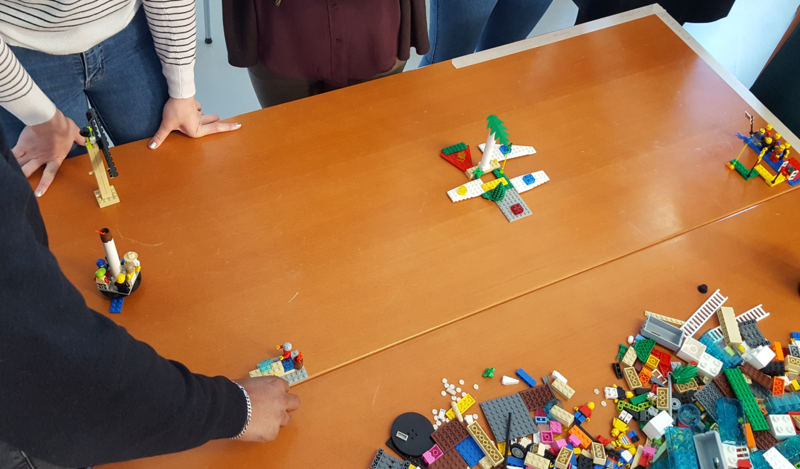 The purpose of the paper is to demonstrate how an innovation course in higher education can be designed, conducted, and evaluated by integrating the entire cycle of innovation using LEGO® SERIOUS PLAY® (LSP). It is not intended to evaluate the LSP method as such, but to adapt it for use in higher education. With this approach, lecturers act more as facilitators for cultivating innovation-related competences and collaborative creativity for real-world problems (Hopp and Zenk, 2012; Steiner, 2013) rather than as experts on a matter who merely present their knowledge. Consequently, LSP is a new teaching method for reflective practice pedagogy in a non-traditional format (James, 2013); it offers creative teaching methods aiming at “teaching for creativity and teaching creatively” (Jeffrey and Craft, 2004). Innovation-related competences and networks of high performing teams are required for more complex challenges (Zenk and Stadtfeld, 2010). Increasing interdependencies and time-sensitive changes in coupled societal and natural systems raise the need for innovation; this integrates the technological and social aspects and is based on multiple forms of knowledge integration (Scholz and Steiner, 2015). This particularly calls for a systemic understanding and an enhanced degree of individual and collaborative creativity. The generation of innovation is usually not random. Instead, process and method-guided collaborative problem solving processes are essential for most innovation efforts. While single methods might often be applied for certain simple problem phases, more comprehensive innovation processes should be applied for more complex problems (Plattner, Meinel, and Leifer, 2011; Ries, 2011; Sarasvathy, 2009; Steiner, 2014). The role of higher education in teaching innovation-related methods and competences is of particular interest from a pedagogical viewpoint. To adapt pedagogical models to the changing higher education climate characterized by diversification, specialization, and technological developments, higher education institutions need to adopt new initiatives and innovative pedagogical approaches. The report by the European Commission (2015) on “The changing pedagogical landscape” highlights the need to develop new teaching and learning methods as well as changes in culture and mindsets, especially those related to innovative approaches and new pathways of teaching, e.g. experiential learning in teams. In a given policy context, recent pedagogical approaches have been geared toward enhancing students’ innovation-related competences and contributing to their personal and professional growth. Studies on competence measurements in education mostly deal either with the assessment of students’ competences (Anne Støren and Bjornali, 2012; Cuenca et al., 2015; Zlatkin-Troitschanskaia, Shavelson, and Kuhn, 2015) or with the teachers’ technological and pedagogical content knowledge (Schmidt et al., 2009). Innovation pedagogy refers to teaching and learning with the aim of fostering capabilities for innovation using existing methods in creative and value-increasing ways (Penttilä et al., 2013). At the same time, it inspires the generation of new teaching methods (e.g. open textbook editing, intergroup empathy, immersive learning, and student-led analytics) while ensuring that students take responsibility for their own learning. Furthermore, it emphasizes the immediate problem solving application of knowledge during the learning process. However, studies on innovation pedagogy and faculty abilities in cultivating innovation-related competences in students are remarkably rare (Ferguson et al., 2018). It seems beneficial to extend the field of innovation pedagogy in the future by increasingly integrating lessons learned in closely related fields of education and training for complex and creative problem solving. The learning process at higher education institutions is based more and more on constructively aligned curriculum design development and deep learning (Biggs and Tang, 2011). In this approach, the focus is not only on the classroom but also on a whole set of learning activities in which teaching and assessment are designed to meet the learning outcomes. In our course development, we used a system theoretical perspective in instructional design (Diamond, 2008) as a detailed process approach to solve complex problems and address educational issues (Fink, 2003; Westera, 2001). The design includes the “pyramid model,” which has a broad introduction and step-by-step architecture to narrow and adjust the focus. Moreover, “vertical or LEGO” design elements were used as teaching and learning components stacked one on the other (Fry et al., 2015). This work reports an innovation course using LSP. In section 2, we provide a brief general overview of LSP and a summary of current research findings on LSP as a teaching method in higher education. Section 3 describes the design of the innovation course with an emphasis on LSP techniques. Section 4 describes methodology and section 5 summarizes course evaluations using LSP as an evaluation tool. Section 6 discusses findings and section 7 concludes this paper with a brief outlook into future research and implications. LEGO® SERIOUS PLAY® (LSP) was developed through a transdisciplinary process in collaboration with the company LEGO and the IMD Business School in Lausanne in order to create a new method of playing seriously with strategy (Roos, Victor, and Statler, 2004). Since 2010, LSP has become a community model, and universities have gradually started to analyze LSP as a facilitated meeting, communication, and problem solving process and apply it as an integrated method in the context of higher education (James, 2015). From a theoretical viewpoint, LEGO® bricks can be seen as artefacts that externalize and hence support thought processes: “having ideas through the process of making” (Gauntlett, 2018, p.12). In contrast to other artefacts (e.g. modelling clay, drawings, etc. ), participants are not afraid to get their hands dirty, and they do not have to worry if they are not skilled at drawing (Hadida, 2013). One of the essential theoretical backgrounds to better understanding the interaction with artefacts is found in constructionism (Papert and Harel, 1991) based on Piaget’s constructivism (Glasersfeld, 1982). From a constructivist perspective, humans constantly construct and reconstruct their knowledge about the world via their personal experience (Ackermann, 2001). In contrast to this theoretical approach, Papert and Harel (1991) emphasized “making things” to express ideas via the use of media. Their assumption is “that everything be understood by being constructed” (Papert and Harel, 1991, p.1). Originally, LEGO® bricks were built for children to use as metonyms, i.e. representations of existing objects such as airplanes. In LSP they are utilized for metaphors as a way to understand things (Schön, 2017) and to create expressive imagery of beliefs and values (Lakoff and Johnson, 2008). From this point of view, an airplane, or even a set of blue bricks, can be used to express the metaphor “the sky’s the limit.” The bricks themselves offer extensive ways to build models and metaphors but are only effective in combination with accurately facilitated processes that support a mindset for solving ill-defined problems (Moreau and Engeset, 2015; Primus and Sonnenburg, 2018). In that sense, the bricks are used as a language for collaborative creativity using words (bricks) and grammar (processes). The main procedure is based on a four-step core process in which participants have time to individually generate ideas by constructing models and subsequently sharing their insights with the group and reflecting on their findings (Table 1). This process is used in conjunction with seven Application Techniques that describe how to apply LSP processes in workshops (Kristiansen and Rasmussen, 2014), e.g. Application Technique 1 (AT1): “Building Individual Models and Stories” to explore one’s own knowledge and share it; AT2 “Building Shared Models and Stories” to co-create a shared model using individual models; and AT3 “Creating a Landscape” to systematically analyze the different individual models by placing them near or far from each other. These Application Techniques can be used to design customer-oriented workshops and courses. 1. Pose the question	 Ask a challenging question without an obvious answer. 2. Construction	 Participants answer the question by constructing a model with LEGO® bricks. 3. Sharing	 Each participant briefly explains his/her model. 4. Reflecting	 The group reflects on what they have observed. Since 2010, LSP has been increasingly used in academia. Several publications have demonstrated its value, especially in the field of education (Gauntlett, 2018; James, 2015). The original purpose of LSP focused on board meetings to increase creativity and imagination for strategic development; this method has yet to be further adapted to design student-oriented university courses. Several studies evaluated steps to provide students with experiential learning settings to promote reflective thinking via different methods and media that produce kinesthetic experiences (Frick, et al., 2013; Gauntlett, 2018; James and Brookfield, 2014; O’Donoghue, 2010). For example, Nerantzi and Mccusker (2014) presented two case studies involving students reflecting on their identity of becoming teachers. Peabody and Noyes (2017) investigated LSP as a reflective practice pedagogy, and their results indicated a positive outcome on group cohesion, inclusive learning, a language for emotional content, and an experiential process related to various learning styles. Other studies focused on new teaching formats and different roles of teachers. James (2013) investigated non-traditional formats in the context of creative arts education, particularly with regard to LSP, because this method includes informality, freedom, ownership, and physical engagement in the learning space. Although she was skeptical in the beginning of applying a method that uses LEGO® bricks, she received consistently positive feedback. Montesa-Andres, Garrigós-Simón, and Narangajavana (2014) conclude that finding new learning methods like LSP allows us to rethink the teaching process, i.e. teachers become facilitators. Dann (2018) conducted three qualitative and quantitative studies and presented guidelines to bring LSP techniques from the boardrooms of industries to the classrooms of universities. He emphasizes a safe environment for social risk-taking that gradually introduces students to these methods by permitting play. This helps them take ownership of the meaning of their models and enables a process of discovery. James (2015) applied LSP for more than six years in higher education and collected evaluations from more than 1,000 international students. She used LSP for higher education including in the context of learning abilities, Ph.D. inductions, consultancy projects, teamwork, and personal and professional development. One of her conclusions was “that you can combine playful methods with high-stakes activity, but not at the expense of high standards or the credibility of the academic level” (p. 11). Building on these and other studies and applications, the following customized workshop was designed for an innovation course in the context of digital entrepreneurship in which students experience and reflect on the process of collaborative creativity and innovation via LSP. In many studies, LSP is used as part of a course design, e.g. as a warm-up, team building, or an evaluation method. This study attempts to design a course using almost exclusively LSP for the entire cycle of innovation. Additionally, LSP is used for the evaluation of the course itself to reflect on its applicability in academic practice (McCusker, 2014). The following study was performed in two identical university courses on research and innovation methods with 38 students in total in an extra-occupational master program in Austria. This course helps students experience collaborative creativity and innovation by having them work jointly on the co-creation of a prototype in teams of 3 to 4 students and to reflect on these methods. The continuing spread of LSP in innovation management and higher education was a key motivation for the lecturers to apply this method in higher education. All three lecturers are experienced trainers and facilitators who work and teach in the field of creativity and innovation; two of them are certified LSP facilitators. They recognized the value of providing students with experiential learning settings in the frame of innovation pedagogy that focuses on ill-defined problems and real-world challenges (Moreau and Engeset, 2015). Table 2 depicts the schedule of the course, which was carried out twice with 19 students each time. It consists of three course units including classroom-based training 1, self-studies in teams, and classroom-based training 2. In classroom-based training 1 (see Table 3), three groups of 6 to 7 persons were formed and seated in a set of tables with LEGO® bricks based on, inter alia, sets of “Identity and Landscape.” The training started with an introduction and skills building in which students experienced the core process and methodology of LSP. Presentation Understand the theories and method of LSP. Ideal team Experience the core process of LSP and become aware of different mental models. Distinguish between metonym and metaphor. Imagine future scenarios and tell stories about them. Solutions Raise awareness of your own and your group’ interests and skills. Identify possible needs of the group or the market. Ideate solutions that match the skills and the needs (divergent thinking). Get an overview of generated ideas collaboratively. Decide which ideas are most appropriate for projects (convergent thinking). Decide with whom to collaborate. Tell a story about the project idea. Note 1: AT refers Application Techniques (Kristiansen and Rasmussen, 2014). Note 2: There was a break between Skills-building and Ideation. The phase of ideation was initiated in building ideas with LEGO® bricks. This consisted of three processes that fostered the generation of ideas for new projects. In the first iteration of ideation (skills), the students had to construct one aspect of their personal skill to get an overview of the talents and interests available within the group (AT1: Building Individual Models and Stories). In the second iteration of ideation (needs), they were asked to ideate possible needs of the group that could be realized with the group's skills. In the following discussion, the needs were generalized to possible current needs in the market. In the third iteration of ideation (solutions), a question was posed and prototypical solutions that matched the skills and the needs of the group were offered. These were responsive to an imagined target group or market. All models were placed on a table to have an overview of the skills, needs, and solutions of the group (see Figure 1). The learning objective of the ideation phase was to make the students aware of their own and group skills, to articulate possible needs of the group or market, and to generate ideas that could be realized by the group. In the selection phase, the most promising ideas had to be identified and selected. In order to achieve this task, two axes were drawn on a new table representing the students’ motivation to work on a specific idea and their estimation of to what extent this idea could be implemented realistically (Adapted Application Technique 3: Creating a Landscape, see Figure 2a). In this phase, students had to decide which ideas were most appropriate based on two criteria: motivation and realization. In the last phase of prototyping, the students had to establish teams of 3 to 4 persons and decide which idea they planned to elaborate as a team. To do this, they took one or more of the models and collaboratively constructed a first prototype of their project idea (Application Technique 2: Building Shared Models and Stories). The final task was to tell a short story about their prototype (see Figure 2b). The story was videotaped and uploaded on a Moodle platform. Thus, students could watch the video later during their self-studies. The classroom-based training 2 (Table 4) in which the teams had to pitch their projects in five minutes, was conducted three months later. Immediately afterward, they were asked about their project by other students and the lecturers; they received feedback on how they could further advance these projects. Pitch the project in 5 minutes. Reconnect to the material and method. Rethink the current project through what-if scenarios. Critically reflect on the applied method. Note 2: There was a break after the Presentations. (1) Pivoting (Ries, 2011): Imagine that your project has failed. What else can you create with your existing resources and skills? In innovation processes, prototypes must be continually adapted depending on the current situation (Sarasvathy, 2009). Pivoting in that sense means that the team must shift to a new strategy to face upcoming challenges towards the future. (2) Pre-mortem (Kahneman and Klein, 2009; Klein, 2008): Assume that you started your project and after a year you recognize that it has been a total disaster. What has happened? This assumption allowed the students to look back from the future and criticize their own project. In this way, they could identify possible threats, challenge the group illusion of consensus, and become aware not to overestimate the chances that their innovative prototypes will be easily realized. To conclude and critically reflect on the applied method, the LSP method was evaluated using LSP itself (Application Technique 3: Creating a Landscape; see Figure 3). We used a qualitative approach with two open questions to evaluate the course concerning the advantages and disadvantages of the LSP method in the context of higher education. The study emphasized reflective conversations via storytelling using LEGO® bricks in a group discussion setting; this promoted reflections on experiences between group members (Peabody and Noyes, 2017). Nerantzi and Despard (2014) have investigated the use of LSP as an evaluation method in the context of professional discussion, and they reported that “the LEGO® models seem to have made a real difference to the depth of reflection, meaning-making and communicating learning” (p. 34). At the end of the course, all the students who attended took part in the evaluation of the method, and this was not part of their grading. They were split into groups of 7 to 9 persons from different teams and had to build individual models of the advantages and disadvantages (“Please individually build one essential aspect of an advantage or disadvantage of the method”). The students subsequently placed their individual models close to related models of their colleagues to analyze and interpret the clusters of similar models and to recognize differences as well. To find the overall topics of the clusters, they annotated them by writing down the main categories on post-it notes and stuck them to the clusters (see Figure 3). Finally, each group summarized their group discussions and results. Each presentation of the groups took on average approximately two minutes and was video recorded. The analysis was performed for each statement by manually transcribing the explanations of the students’ LEGO models from the footage and categorizing the statements into topics using Excel. The participants emphasized the beneficial effects of this method on group interaction and communication: The LSP process supported equality within the group (“democratic character”) and facilitated the exchange of ideas. In particular, the statement “the use of LEGO® bricks facilitates the adoption of the perspectives of the other team members” is a strong indicator that the method promotes perspective taking. Perspective taking is the ability “to intuit another person’s thoughts, feelings, and inner mental states” (Epley and Caruso, 2009, p. 297) and is an important factor in mutual learning. Communication and mutual learning are additionally supported by various possibilities to represent information and to convey one’s viewpoint to others. Because only the owner of the model knew its meaning, other participants had to ask open questions to better understand the other’s viewpoint. On an individual level, the students stated that LSP can assist them in generating new ideas. Finally, their experience with LSP was characterized as joyful. The advantages of LSP are summarised in table 5. Exchange of Ideas The use of LEGO® bricks facilitates the adoption of the perspectives of the other team members and helps to gain new perspectives. LSP promotes exchange and new connections between team members. LSP promotes the exchange of different viewpoints. LSP promotes the creation of new ideas by exchanging ideas with other members via the LEGO® bricks. Creative Thinking	 LSP gives free rein to ideas. LSP reinforces thinking outside the box. Some aspects of an idea only become clear when looking at what was constructed. LSP makes it possible to generate new ideas quickly. The explorative character of LSP promotes the generation of new ideas. Representation of Information	 The use of LEGO® bricks allows visual representations of incremental processes. The use of LEGO® bricks allows visualizing individual strengths and characteristics. The various ways, in which LEGO® bricks can be used to communicate inspires creativity. LSP facilitates the identification of one’s own and common competences. The use of LEGO® bricks to represent ideas facilitates identifying ideas the group likes best and finding a common denominator easily. Quality of Group Interaction	 The democratic character of LSP promotes joint solution finding. LSP supports equality within the team. LSP reminds you of your own childhood when you played with LEGO® bricks. The students also addressed the challenges and limitations of the method. The first impressions were rather ambivalent: while some of the students were easily drawn into the method, others stated that they had to overcome their inhibition threshold at the beginning or were even sceptical and experienced the method as rather chaotic. Certain obstacles were identified: people could not reproduce their ideas with LEGO® bricks, or they were distracted by the playful nature of the method. In addition, the students identified some problems regarding the practical usefulness of the method, e.g. the prototypes generated with the method were described as vague if the interpretations were not stated clearly. Consequently, some limits of LSP have been defined: some students suggested that LSP is especially appropriate in the earlier phases of an ideation process. The disadvantages of LSP are summarised in table 6. Reluctance of Participants	 The use of LEGO® bricks to generate ideas seems rather vague and chaotic at first. In the beginning, there is a lack of seriousness, as one does not know how to build with LEGO® bricks. Inhibitions to build with LEGO® bricks need to be overcome first. Scepticism exists especially, at the beginning, as one does not yet know what to expect. Obstacles to Implementation	 Participants may feel distracted from the actual task. The use of LEGO® bricks makes it harder to question or reflect on ideas. The playfulness of LSP could be distracting for some participants. Participants may be frustrated by their inability to visualise abstract ideas. Criticism of the Outcome	 Differences in the imagination of the team members could lead to a different understanding and interpretation of the ideas, strategies and outcomes built with LEGO® bricks. The ideas and strategies represented with LEGO® bricks are not 100% clear. It is difficult to formulate a concrete result from the models generated with LEGO® bricks. Limitations of the Methodology	 LSP is only suitable for certain phases of innovation: it is appropriate for early phases of creative idea generation but not for the elaboration of concrete steps and measures. After a number of rounds, an idea is developed that cannot be further improved with LEGO® bricks. LSP is time-consuming: It takes a while to obtain a certain result. LSP is probably not suitable for all people, such as conservative people. With very creative people, the LSP might even restrict their creativity. LSP is only suitable in a group setting, otherwise there is no dynamic. After some rounds, one knows what to expect and then LSP is no longer exciting. LSP requires support in order to use the LEGO® bricks in a structured way. In this applied research project, LSP was implemented as a facilitated meeting, communication, and problem solving process. The main objective was to design an innovation course in which students experience the entire cycle of an innovation process. A crucial aspect of higher education institutions' tasks is to provide students with the competences required for complex problem solving. Innovations cannot be developed and complex problems cannot be solved by standard solutions and processes alone; rather, they require individual and collaborative creativity embedded in the framework of a systemic understanding (Steiner, 2013). To strive towards an innovation pedagogy and to cultivate and foster innovation-related competences in students (Kettunen, 2011), the innovation processes in this course were translated into the LSP methodology. The reason for this was to provide students with the experience of co-creative activities and to enable them to experience individual flow (Nakamura and Csikszentmihalyi, 2014) and group flow (Primus and Sonnenburg, 2018; Sawyer, 2003). According to Montesa-Andres, Garrigós-Simón, and Narangajavana (2014), the lecturers acted as facilitators who attempted to support the groups in their cocreative tasks. Instead of exerting pressure with regard to grading, a safe environment and social risk-taking were priorities (Dann, 2018). Nevertheless, the teams were confronted with complex entrepreneurial challenges and had to present in front of their peers to combine playful methods with high-stakes activity (James, 2015). Similar to the aforementioned studies, the non-traditional format was very positively received in the context of entrepreneurship education. The LSP method was also used to evaluate LSP itself. Unlike classical evaluations in which students individually fill out questionnaires, this new evaluation format was well accepted by the students and provided valuable feedback for the lecturers. LSP has been shown to be a successful tool for innovation pedagogy in higher education (James, 2015). In this work, the students reported clear advantages: LSP supported the exchange of ideas, perspective taking, and communication between group members. This suggests a beneficial effect of LSP on mutual learning. But they also mentioned specific problems such as an initial reluctance to engage with the method or limitations in the usefulness of the method. The use of LSP in the context of higher education requires accurate planning and implementation in order to address the subject of the course as well as the needs of the students. From the perspective of the lecturers, the students collaborated intensely and did not hide behind their mobile devices. In this non-traditional format, it was helpful that the lecturers were trained facilitators who collaboratively designed the course. However, there are some limitations to applying LSP in higher education and in the study. First and foremost, this research field is relatively new, and the study is explorative; future research is needed to acquire more experience in the field. An important factor in this method is the facilitation process and the skills of the facilitators themselves, which were not part of the study. Some of the results might be a consequence of the conducted facilitation and not of the method as such. The advantages and disadvantages of the courses were collected from students who experienced LSP for the first time and were not experts on innovation. Consequently, the statements may also include assumptions on imagined innovation processes. These courses had a relatively short lecture time for the classroom-based trainings; more time could be allocated. Likewise, the preparation and conduct of the course using LSP was time intensive; the group dynamic processes must be planned rigorously and, depending on the course size, much material, i.e. LEGO® bricks, was required. The evaluation format produced new insights; nevertheless, additional questionnaires concerning LSP would provide further ideas for a better understanding of the method. Further suggestions for future research can be derived from our results. The participants stated that LSP may especially be appropriate for specific phases of an innovation cycle and specific kinds of persons. These claims could be scrutinized more closely to identify the most suitable phases of innovation processes and psychological traits or cognitive styles of participants. Furthermore, based on the statements of the students, perspective taking (Epley and Caruso, 2009) could be promoted by LSP. A next logical step would be to shift from qualitative, observational studies to quantitative, experimental studies and to test these specific aspects of LSP in a controlled setting. In a fast-changing society, collaborative creativity and innovation are keys to meeting the increased complexity of today’s real-world problems. They cannot be solved by applying solutions “off the shelf” or simply utilizing purely reproduced knowledge. Thus, the community should reconsider traditional formats and scrutinize or even “creatively destruct” (Schumpeter and Opie, 1934) classical university courses to design innovative pedagogical approaches. A particular challenge for this research will be a design laboratory and real-world field experiments that can explore the effects of methods such as LSP applied as experiential learning settings. The demand for introducing new pedagogical approaches goes beyond the application of one specific method such as LSP; it should encompass multiple dimensions. The design of a comprehensive method portfolio that includes LSP as an integral part builds on the interdependency with other analytical, systemic, and creative training methods by making use of the individual methods’ peculiarities as well as their potential synergies. To achieve such ambitious goals, this field needs appropriate pedagogical mechanisms as well as the establishment of required learning settings, organizational structures, and role profiles. Scholars from the Turku University of Applied Sciences in Finland made one recent theoretical contribution. This group developed the concept of innovation pedagogy with a view to improving the relevance of university training and fostering the link between education, research, and the labor market. This broad teaching and learning approach “defines in a new way how knowledge is assimilated, produced, and used in a manner that can create innovations” (Kairisto‐Mertanen, 2013, p. 7). Innovation pedagogy embraces organizational setting and climate, flexible curricula, learning and teaching methods, RandD operations, entrepreneurship, and service activities (Kettunen, 2011), which together are called meta-innovations (Kettunen et al., 2013). Within this framework, teacher performance is regarded as a tool for fostering capabilities for innovation. It calls for the utilization of existing teaching and learning methods in a creative and value-increasing way. At the same time, it inspires a generation of new teaching methods while ensuring that students take responsibility for their own learning. Furthermore, it emphasizes the immediate problem solving application of knowledge during the learning process. As a result, students graduate with professional skills and qualifications that are both innovative and development oriented. Integrating methods such as LSP in this framework may contribute to innovation-related competences that support students in facing complex real-world challenges. The authors recognise the contribution of Thomas Dori for co-designing and co-lecturing the course. LEGO, SERIOUS PLAY, IMAGINOPEDIA, the Minifigure and the Brick and Knob configurations are trademarks of the LEGO Group, which does not sponsor, authorize or endorse this academic work by Lukas Zenk, Nicole Hynek, Günther Schreder, Agnes Zenk, Attila Pausits, and Gerald Steiner, Danube University Krems, Austria. Ackermann, E. (2001), “Piaget’s Constructivism, Papert’s Constructionism: What’s the difference?”, Future of Learning Group Publication, Vol. 4, No. 3, pp. 438-449. Altbach, P. and McGill, P. (2007), Higher education in the new century: global challenges and innovative ideas, Rotterdam, Netherlands: Sense Publishers. Biggs, J and Tang, C (2011), Teaching for Quality Learning at University: What the students does?, 4th ed., Maidenhead: Open University Press. Epley, N., and Caruso, E. (2009), “Perspective Taking: Misstepping Into Others’ Shoes”, In: K. D. Markman, W. M. P. Klein, and J. A. Suhr (Eds. ), Handbook of Imagination and Simulation, New York: Psychology Press, pp. 295–309. European Commission (2015), The changing pedagogical landscape: New ways of teaching and learning and their implications for higher education policy, Luxembourg: Publication Office of the European Union. Ferguson, R., Barzilai, S., Ben-Zvi, D., Chinn, C.A., Herodotou, C., Hod, Y., Kali, Y., Kukulska-Hulme, A., Kupermintz, H., McAndrew, P., Rienties, B., Sagy, O., Scanlon, E., Sharples, M., Weller, M., and Whitelock, D. (2017), Innovating Pedagogy 2017: Open University Innovation Report 6, Milton Keynes: The Open University, UK. Fink, L.D. (2003), Creating Significant Learning Experiences, San Francisco, CA: Jossey Bass. Frick, E., Tardini, S. and Cantoni, L., (2013), White paper on LEGO® SERIOUS PLAY®: A state of the art of its applications in Europe, Lugano: Università della Svizzera Italiana. [Online] Available from: http://www.s-play.eu/attachments/article/70/splay_White_Paper_V2_0_1.pdf [accessed on 18 Sept 2018]. Fry, H., Ketteridge, S., Marshall, S. (Eds.). (2015), A Handbook for Teaching and Learning in Higher Education, London: Routledge. Gauntlett, D. (2018), Making is Connecting: The social power of creativity, from craft and knitting to digital everything, 2nd ed., Medford, MA: Polity Press. Glasersfeld, E. von. (1982), “An Interpretation of Piaget´s Constructivism”, Revue Internationale de Philosophie, Vol. 36, No. 142/143, pp. 612–635. James, A.R., (2013), “LEGO® SERIOUS PLAY®: a three-dimensional approach to learning development”, Journal of Learning Development in Higher Education, No. 6, pp. 1-18. James, A. (2015), Innovative pedagogies series: Innovating in the Creative Arts with LEGO®, York: Higher Education Academy [Online] Available from: https://www.heacademy.ac.uk/system/files/alison_james_final.pdf [Accessed on 1 Dec 2018]. James, A., and Brookfield, S. (2014), Engaging imagination: helping students become creative and reflective thinkers, San Francisco: Jossey-Bass. Kairisto‐Mertanen, L. (2013), “Aiming at innovation expertise”, In A. Lehto and T. Penttilä (Eds. ), Pedagogical views on innovation competences and entrepreneurship, Tampere, Finland: Juvenes Print Oy, pp. 7–10. Kristiansen, P., and Rasmussen, R. (2014), Building a better business using the Lego serious play method, Hoboken, New Jersey: Wiley. Lakoff, G., and Johnson, M. (2008), Metaphors We Live By, Chicago: University of Chicago Press. Mccusker, S. (2014), “LEGO® SERIOUS PLAY®: Thinking about Teaching and Learning”, International Journal of Knowledge, Innovation and Entrepreneurship, Vol. 2, No. 1, pp. 27-37. Papert, S. and Harel, I. (1991), Constructionism, Norwood, N.J.: Ablex Publishing Corporation. Plattner, H., Meinel, C., and Leifer, L. (Eds.). (2011), Design thinking: understand - improve – apply, Berlin: Springer. Ries, E. (2011), The Lean Startup: How Today’s Entrepreneurs Use Continuous Innovation to Create Radically Successful Businesses, New York: Currency. Sarasvathy, S. D. (2009), Effectuation: Elements of Entrepreneurial Expertise, UK: Edward Elgar Publishing. Sawyer, R. K. (2003), Group creativity: music, theater, collaboration, Mahwah, N.J: L. Erlbaum Associates. Schön, D. A. (2017), The Reflective Practitioner: How Professionals Think in Action, USA: Routledge. Schumpeter, J. A., and Opie, R. (1934), The theory of economic development; an inquiry into profits, capital, credit, interest, and the business cycle, Cambridge, Mass. : Harvard University Press. Steiner, G. (2013), Competences for Complex Real-World Problems: Toward an Integrative Framework. Working Paper 2013-0002, Cambridge: Harvard University. [Online] Available from: https://wcfia.harvard.edu/files/wcfia/files/full_steiner_13-0002.pdf [Accessed on 1 Dec 2018]. Steiner, G. (2014), Problem Discovery as a Collaborative, Creative, and Method-Guided Search for the “Real Problems” as Raw Diamonds of Innovation, Cambridge: Harvard University. [Online] Available from: https://wcfia.harvard.edu/files/wcfia/files/steiner_problemdiscovery_14-0003_0.pdf [Accessed on 1 Dec 2018].